It’s raining outside and I have a large bag of Meyer lemons from my nana’s tree. Meyer lemons are my favourite thing of all time and I love winter for the abundance of these bright, citrus globes that make their way to my table after I visit my nanna and raid her garden (I often return home yeilding loads of kumquats, lemons, bay leaves, proteas and native flowers and odds and ends from the local op-shops). 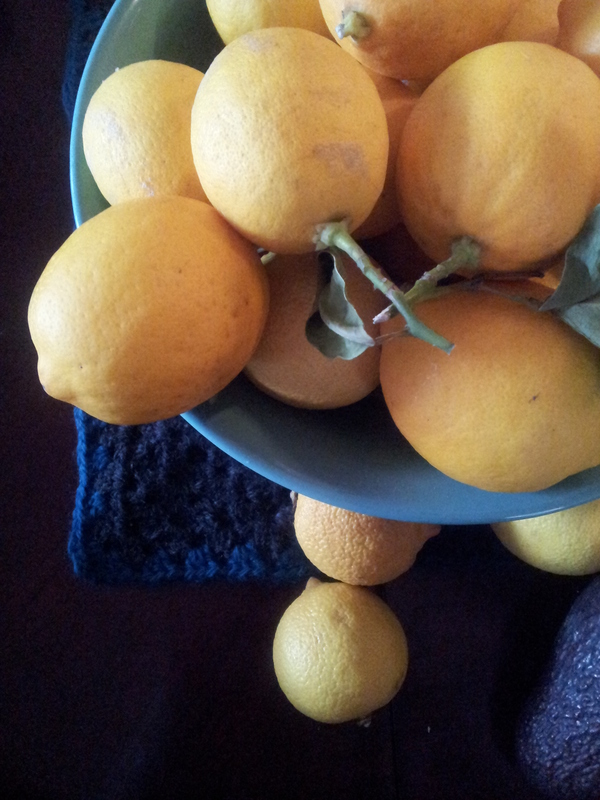 Meyer lemons have a thinner and darker yellow skin than the common Lisbon and are sweeter. Almost like a cross between a mandarin and a lemon. Because of their smooth, soft thin skin, they do not have a long shelf life and so are not really sold commercially. The flavour evokes memories of long, hot summer days reading books in a hammock, sipping lemon cordial from vintage anodised cups at my mum’s. Mum would have got the lemons from someone’s tree, but they were often in boxes at op-shops available to “help yourself”, as the old ladies would bring them in. They have a delicious, old fashioned taste that I just adore and a salad dressing made with dijon, garlic, olive oil and lemon juice makes my happiness levels soar and my taste buds sing! In a bowl, mix together oil, sugar, eggs and lemon zest. Stir until well combined. Add yoghurt and lemon juice and mix well. Sift in flour and salt and fold through. Stir through Chia. Cook for about 30 minutes at 180C or until a skewer comes out clean.